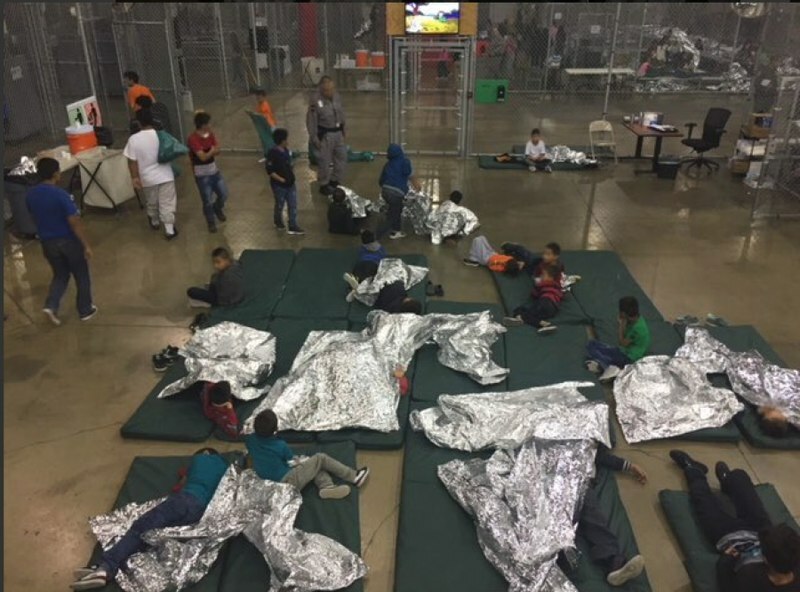 Detained children in a wire mesh compartment, showing sleeping mats and thermal blankets on floor. Photo provided by Custom and Border Protection to reporter on tour of detention facility in McAllen, Texas. Reporters were not allowed (BY WHAT RIGHT!?!) to take their own photos. Photo on 17 June 2018, provided by the U.S. Customs and Border Control. Not all concentration camps are death camps. But they all concentrate people who are considered to be unwelcome, and they all are miserable places to inhabit. Listen to this audio recorded by ProPublica, and accessible via Wikipedia. So Trump’s camps for kids who were forcibly separated from their parents are indeed concentration camps. Did Steve Bannon suggest Trump’s concentration camps for kids? Bannon was responsible for suggesting Trump’s failed ban on visitors from particular predominantly Muslim countries. Bannon is also known for suggesting actions that will excite Trump’s “base”. So the idea of concentration camps for kids smells like Bannon. Like Bannon’s suggested ban on visitors from Muslim countries, the executive order for concentration camps for kids has produced a dramatic defeat for Trump. If Bannon is indeed responsible for it, he will have been responsible for both of the major defeats so far during Trump’s presidency. Bannon also boasted of having made Breitbart into a vehicle for spreading the ideas of the racial-ethnic supremacists. That problably led to Trump’s claim – after the debacle in Charlottesville – of moral equivalence between the supremacists and their opponents, a claim that shredded Trump’s reputation. Bannon is a font of bad advice. What was said of Lord Byron applies even more strongly to Bannon: he is mad, bad, and dangerous to know. 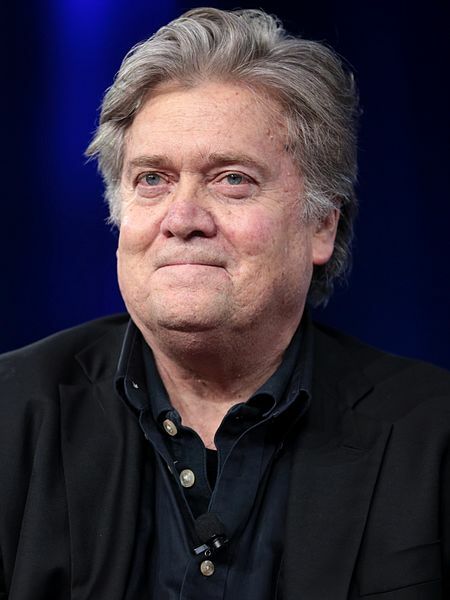 Steve Bannon speaking at the 2017 CPAC in National Harbor, Maryland. Photo by Gage Skidmore. 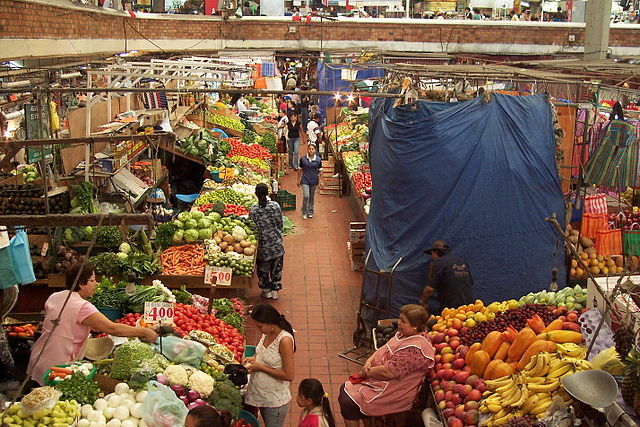 In the San Juan de Dios Market in Guadalajara, Jalisco, MEXICO. Photo by Christian Frausto Bernal (Tepic, Nayarit, MEXICO), on 26 June 2006. It is possible to preserve NAFTA in effect, if not in name, despite Trump’s attacks and despite his divide-and-conquer tactics. President Chump is a more accurate terminology than President Trump, so that is what he will be called in what follows. To preserve NAFTA in effect, the most important thing is to forestall President Chump’s divide-and-conquer tactic. Chump prefers one-on-one negociations, because in one-on-one negociations he is better able to bully and to lie. Canada and Mexico should agree beforehand that in all negociations on trade with the US, their positions will be coordinated, even during negociations between the US and only one of those countries. Before any further trade negotiations with the US, Canada and Mexico should agree on an initial combined list of features that they want to have in their agreements with the US. They should jointly announce those initial goals, while stressing their understanding that the list may be revised as a result of the negotiations with the US. They should then announce that even during any one-on-one negotiations with the US, the currently-negociating non-US negotiator will accept only what is also accepted by the not-currently-negotiating non-US negotiator. It should be explicitly announced that the two countries will always synchronize their agreements with the US, much as a person’s smart phone and computer are often kept synchronized even when each is used separately. Let A and B be abbreviations for the two non-US negotiators. During all trade negotiations with the US, A should insist that it will accept only changes that are also accepted in side-discussions between A and B, even if that forces a prior agreement between B and the US to be updated before A‘s negotiations with the US can continue. Britain and the EU can similarly defeat Chump’s divide-and-conquer attempts in negotiations with with them. At all times, keep in mind that Chump wants to bully you, that he is psychopathic liar, famous for falsely promising whatever his target wants to hear, and that divide-and-conquer helps him to get away with both bullying and with lying. To counter a would-be-bully, remind him of his inadequacies and insecurities. Do so at every opportunity. Practice, so that whenever you shake Chump’s hand, you have grip of steel. With his small hands, Chump won’t be able to exert as much force. The goal is to make his orange face turn red, and then white. By limiting the damage that flea-brained Chump can do to international trade, you will be doing a great service to the US and to the world, as well as to your own country. “Flea-brained” is a precise description in Chump’s case, because a flea hops first here, then there, and never thinks carefully before the next hop. 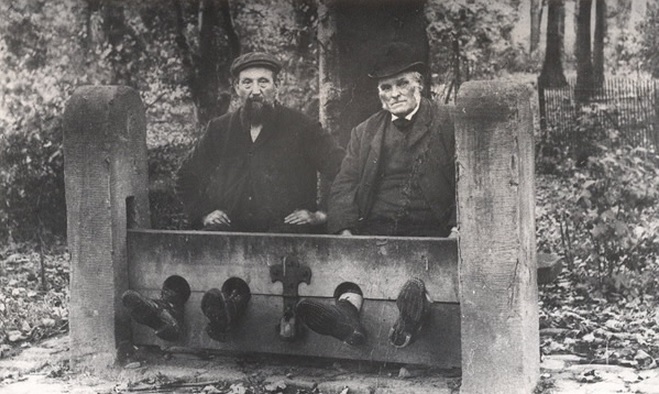 Men in Bramhall stocks, Bramhall, England, 1900, unknown photographer. Trump has admitted his guilt, without realizing that he has done so. This point was made recently by Paul Waldman, in an article in the Washington Post. There would be no need for the Attorney General to protect Trump from the investigation of Putin’s interference in the the Presidential election in 2016, if Trump had not done something illegal in connection with that election. The Attorney General’s job is to protect the American people from crime, not to protect the President – or anyone else – from the consequences of illegal actions. About the nature of Trump’s crime, we know only that it pertains to Putin’s interference in the Presidential election in 2016. That is the topic that always presses Trump’s buttons, and elicits his most feverishly desparate reactions. Further evidence of Trump’s knowledge of his own guilt occured in Trump’s meeting with Sessions in March 2017. According to Paul Waldman’s article, “[Trump’s] grievance was with Mr. Sessions: The president objected to [Session’s] decision to recuse himself from the Russia investigation. Mr. Trump, who had told aides that he needed a loyalist overseeing the inquiry, berated Mr. Sessions and told him he should reverse his decision, an unusual and potentially inappropriate request.” Why would Trump need “a loyalist overseeing the inquiry”, if he wasn’t scared about some fact connected to this particular topic? See also the previous post on this blog. If you want to comment on this post, or just want to add your name as endorsing or disputing its assertions, go here. To avoid cluttering the ‘latest postings’ page, WordPress includes the mechanism for commenting only on the page for the individual posting, never on the page that shows all of the recent postings. So click here, scroll to the bottom of the resulting version of this post, and submit your comment.